Statik Selektah enlists Mac Miller and Sean Price for the second single off his upcoming album "Extended Play", dropping June 18th. Track available for purchase on iTunes. 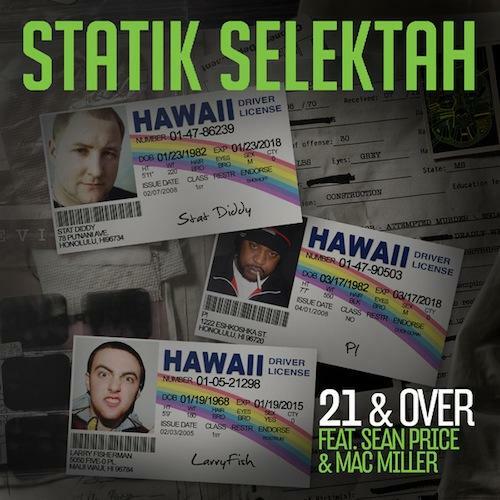 Give 21 & Over a spin - it's a new offering from Statik Selektah, featuring Sean Price & Mac Miller. It was dropped on Tuesday, May 14th, 2013. Statik Selektah's rap artistry continues to improve with every release, something which is most definitely evidenced on 21 & Over. His ever-expanding catalogue is definitely better for it, and we're looking forward to the next piece of the puzzle - aren't you? Check out Statik Selektah on Funeral Season (Snippet), featuring Styles P, Bun B & Hit-Boy. If you're down, make sure to visit Statik Selektah's profile page for the newest info, news, songs, and mixtapes. Check out Statik Selektah's Facebook and Twitter.